Bring home the Wrigleyville celebrations with the 2016 Topps Chicago Cubs World Series Champions Set. The simple factory release features 25 cards in a commemorative box. Joining the many World Series collectibles and Topps Now cards for the Chicago Cubs' big win, the 2016 Topps Chicago Cubs World Series Champions Set is less about high values or extreme rarity and more about a basic way to honor the end of the curse. As most likely know, the Chicago Cubs bested the Cleveland Indians in the 2016 World Series. 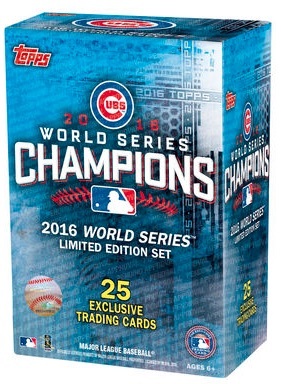 The 2016 Topps Chicago Cubs World Series Champions Set is found in a 25-card, blaster-style box. The checklist includes a detailed look at the title-winning team, including cards for Kris Bryant, Jake Arrieta, and Kyle Schwarber, along with World Series MVP Ben Zobrist. All cards are exclusive to this line. Unlike the 2015 edition, which was cancelled after the Kansas City Royals won the title, these are definitely being made. There is also a 15-card blister pack under the same 2016 Topps Chicago Cubs World Series Champions Limited Edition Set banner. These include the first 15 cards from the main checklist. Collectors should be able to find the sets with relative ease and they make a great and inexpensive gift for the MLB fan in your life. 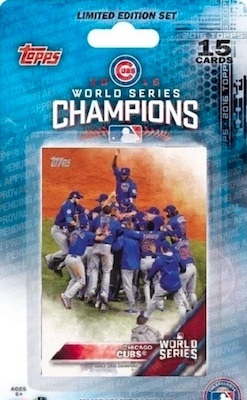 2016 Topps Chicago Cubs World Series Champions Limited Edition versions can be ordered on Amazon or direct from Topps. 25 cards. The blaster includes all 25 cards while the smaller blister has the first 15 cards in the list. Shop for 2016 Topps Chicago Cubs World Series Champions Limited Edition Box Sets on eBay. Without seeing the cards, I’m disappointed by the checklist. Montero had the game winning hit in game 7, and he doesn’t have a card. Mike Montgomery got the save in game 7. He doesn’t have a card. Hendricks, while not qualifying for a win, threw 9 innings while allowing 1 earned run. I would have much more preferred a set with all 25 guys from the roster as well as the coaches. They did that for terrible teams circa 2008. The reason my rating is so low is because although it claims to be a limited edition., unlike the Topps Sapphire Edition which states only 250 sets made., this set gives no production numbers whatsoever and is missing Mike Montgomery and Miguel Montero. 2 key players in game 7. Got the box 25 cards and blaster box 15 cards, #3, #6, & #7 cards are they same cards, and they rest are different, really surprised after seeing checklist. Wished it would also of had all the players, not just a few select players.